« TW- Perspective-Writing Exercise: Write a scene between two characters from the perspective of one person. Then, rewrite the scene from another character’s perspective. Laura flipped over in her sleeping bag, so that she was now facing the top of the tent. Her mouse brown hair poked out of the top of the bag in an any-which-way it wants, no rules, manner that made me wonder how much of it was hair, and how much was pine tar and dirt. “Will you guys shut up? I’m trying to read, here.” Betz moved the flashlight so that she could better see her Hot Stuff comic. She was not about to get dragged into any bickering, so she kept to herself. Amy giggled in the corner with a pile of Little Dot and her friends. Amy didn’t need any of us to have a good time. 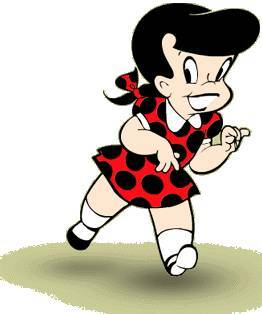 Her nickname was Polka Dot, so she thought that all of the Little Dot comics were written about her. Her wild, curly brown hair, not so much framed her face, as allowed it to exist within it. Her laughter was contagious, so quiet giggles were appropriate for settling us in for the night. The scene was a familiar one, each of us head bent over a comic. It’s what we did in the summer. There was no TV to watch, and there were only so many times that we could read the same few Nancy Drew and Hardy Boys books that were in the shack. The comic book scene was familiar, though the tent was not. We had begged our parents to let us spend the night out in front of the cottage in Great-Uncle Mertz’ army tent. After an unusual amount of begging, we ultimately got the go-ahead and started setting it up. It took forever to get it up and prepped for our adventure. I’m not sure what we expected, but when you are 10, and sleeping outdoors with your best friends all night, the world is your oyster. The adventure came with the rush of independence, the sense that for the next ten hours, we were in charge. If we wanted to stay up all night and read, no one would be there to stop us, and if Old Man Marker’s ghost decided to pay us a visit…no one would be there to protect us. The tent was ancient, army green canvas and fit all five of us with room left over to house a tribe of Pygmies. Once up, its gaping, musty, mouth revealed a coated canvas floor that crinkled as we began staking our claims with sleeping bags and piles of Harvey, DC, and Action Comics. Dinner had been perch that Grampa ‘Kay had caught that morning with Mertz. It was delicious and pared with a three bean and onion salad that Gramma ‘Kay had made. Yummy as it all was, it would prove to be the potential unraveling of our adventure.